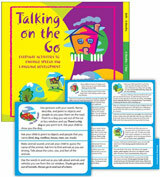 Talking On the Go offers simple and fun suggestions for parents and caregivers to use in a variety of settings. Activities are geared for children from birth through age 5. 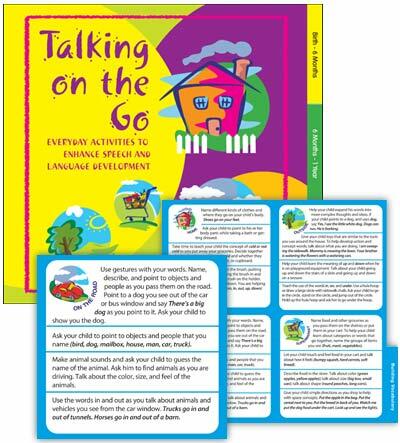 The spiral-bound book includes a pull-out poster and access to an eBook with printable pages. When you purchase this digital product, you will get instant access to your content. Click on the “Access Your Content” link on your order confirmation screen or in your e-mail receipt. You will be prompted to sign in using your ASHA credentials. You will need to be connected to the Internet to view your content. You can access your content from any of your devices or computers from the “My Library” tab on the store, or via your ASHA Account page. Printing is by the page only. Digital products are not available for download to other devices. Please note that this digital product is nonrefundable. Find out more about ASHA's digital products.